1774 Death of Louis XV of France. The Sorrows of Young Werther by Goethe. 1774 Anton Raphael Mengs calls Goya to Madrid. 1775 Goya works on his first series of tapestry designs for the royal palace in the Escorial. 1776Worksonthe second series of tapestry designs, this time for the El Pardo Palace. 1776 American Declaration of Independence. 1778 France and Spain in a maritime war against England. Death of Voltaire. Opening of La Scala in Milan. 1778 Makes engravings of paintings by Velazquez. Further tapestry designs for the El Pardo Palace. 1780 Is accepted into the San Fernando Academy in Madrid. 1781 Critique of Pure Reason by Emmanuel Kant. 1781 Dispute with his brother-in-law Francisco Bayeu while working together on the frescoes in Saragossa cathedral. 1781-1783 Works on altar paintings for the church of San Francisco el Grande in Madrid. 1783 Flight of the first Montgolfier brothers' balloons. Goya's work unexpectedly took a new turn when, in 1774, Mengs called him to Madrid to work for the Royal Tapestry Manufactory. Instead of painting religious frescoes, his task now was to create designs for tapestries; they were to be everyday scenes. After a few rather conventional compositions, Goya was soon producing lively and attractive, sunny images of Spanish life. He was now, for the first time, working for the royal court, even though only in a subordinate position. The young crown prince and his wife, later King Charles IV of Bourbon and Maria Luisa of Parma, were particularly taken with his work. 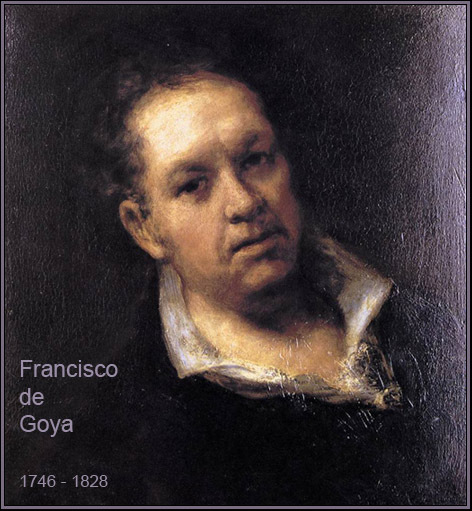 It was in the royal palaces that Goya first saw the paintings of the great Spanish artist Diego Velazquez (1599-1660), who was to have a significant influence on the development of Goya's own rather free technique. Francisco Bayeu had undoubtedly used his influence to find a post at the Santa Barbara tapestry manufactory for his brother-in-law, the 28-year-old Goya. 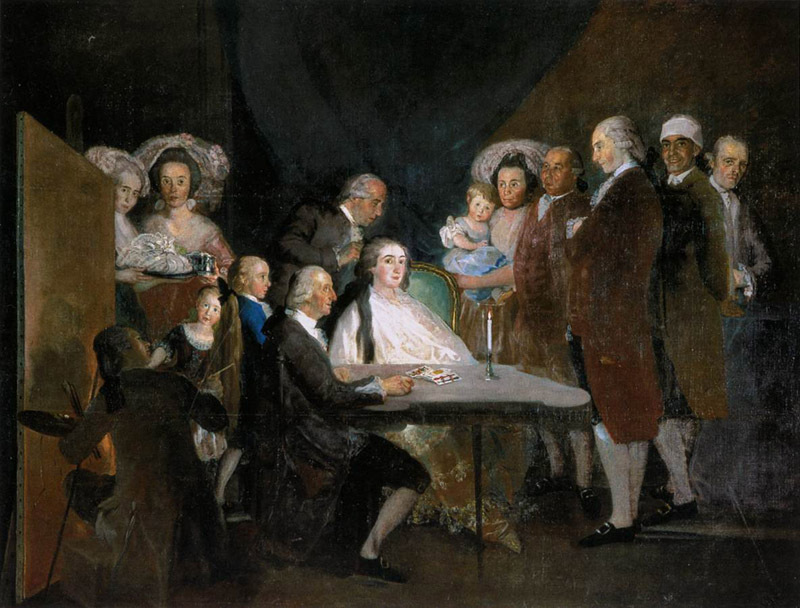 After his official invitation from Mengs towards the end of 1774, Goya had resettled in Madrid and, for the next few years, lived at the Bayeu home with his young wife Josefa. He remained in close contact with his childhood friend Zapater in Saragossa, sending him chocolate, wine, and once even a hunting dog. A contemporary observer thus described Madrid at that time as follows: "In the streets black-veiled women, monks, water carriers and fruit sellers hurry about their business. Long-eared, smooth-shaven mules pull every type of vehicle, be it a splendid equipage, a six-in-hand stagecoach, or a cart full of oranges from Valencia." The Royal Tapestry Manufactory had been founded in 1720 and placed under the management of a specialist from Antwerp. At first, engravings of Dutch genre paintings were used as the designs for the tapestries. Under Mengs' management, young Spanish painters were used to establish original designs. These so-called cartoons - in fact paintings on canvas - were copied on the manufactory looms to create tapestries made from fine thread dyed in every nuance of color. They were destined to become the sumptuous wall decoration in the royal family's palaces, where they also served as insulation against the cold in winter. Goya designed an initial series of cartoons under the immediate supervision of his brother-in-law, as he had no experience in this new trade. The second series, however, was entirely of his own conception. The crown prince and his wife wanted typical Spanish folk themes for their rooms in the El Pardo Palace, a task completely in tune with Goya's own inclinations. He designed a bright, happy medley of folk scenes: dancing and ball games, traveling peddlers and men on stilts, wood cutters and washerwomen, children's games and bullfights. His artistic confidence increased rapidly while he was working on the tapestry cartoons, which are well-balanced compositions painted in fresh, luminous colors. However, these pictures have little to do with a realistic representation of the life of the people: they give the impression that life is nothing but pleasure and play. Even work is done with the light-heartedness and grace of a pastime. 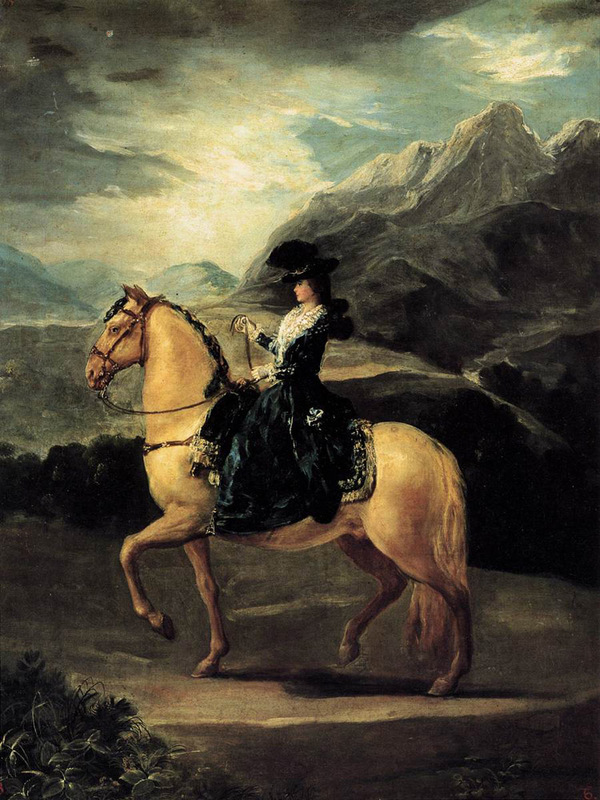 The austere Mengs observed: "Don Francisco Goya ... is an artist of spirit and talent who will make great progress in the arts if he receives the generous support of the royal family." In a period of five years Goya supplied a total of 39 designs. The unusually narrow shape of this tapestry cartoon corresponds to the area to be covered by the tapestry, in the crown prince's dining room in the San Lorenzo castle in the Escorial. The design is from Goya's first series of tapestry cartoons. The nine pictures in the series show hunting scenes in wooded landscapes; they were completed under the supervision of his brother-in-law Bayeu and in collaboration with the latter's brother, Ramon. It is not surprising, therefore, that the rather dry technique is reminiscent of Bayeu's works. Also, the range of themes is traditional. It is obvious that Goya was trying to restrict himself to a few colors and clearly outlined areas so that the conversion of the design into a tapestry would be easier. 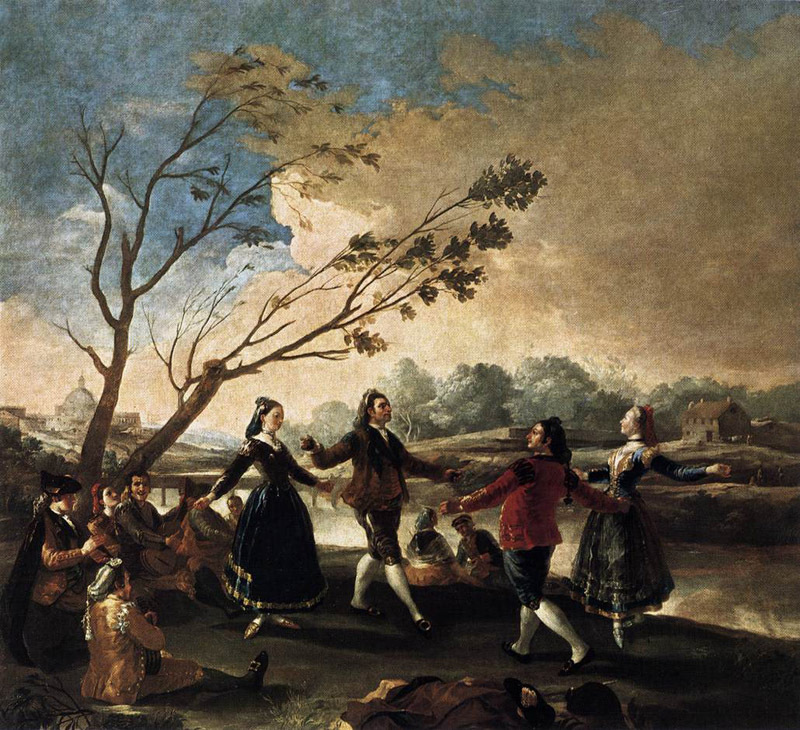 Goya himself described the scene: "Two majos and two majas are dancing the seguidilla, two others are playing the music and one of these is singing to the guitar... in the distance you can see Madrid, with the church of San Fernando." Majos were stylish young men from the lower strata of society, proud, fashion-conscious toughs who wore colorful traditional dress. Majas were their female counterparts. For the aristocracy, the life of the people was an attractive and accessible way of "playing" at life. It amused them, they enjoyed watching the life of the people, portraying it, joining in for a few moments, specifically because it was something different. 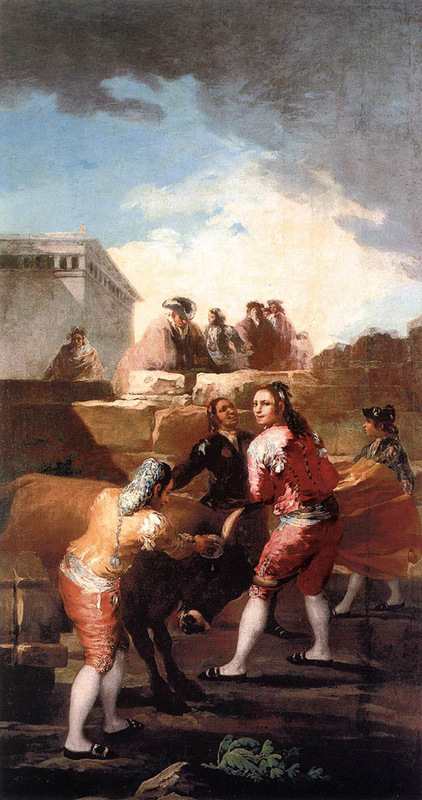 Women play an important part in Goya's tapestry designs. Full of confidence, they dance and flirt with the men, sell oranges or flowers, wash linen, or just take their ease languorously. The observer is drawn into the game of coquetry that has its own elaborate vocabulary of looks and gestures. The young woman in the famous painting The Parasol (opposite) is sitting in a sedate pose, her smile charming and flirtatious. The tapestry was intended for a wall above a door, which is why Goya placed the young beauty on a grassy hummock from which, fully aware of her beauty, she looks down on the observer, delighted at the opportunity to display her charms. Her companion is using the parasol to protect her delicate skin from the sun. 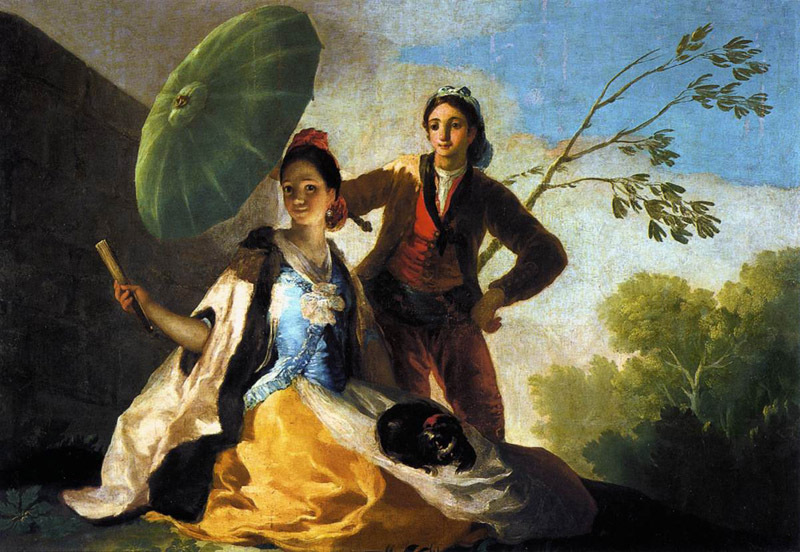 In her hand she is holding a closed fan - an indispensable accessory for Spanish women in Goya's time - as if it were a royal scepter. The often brightly and sumptuously decorated fan was not used solely to create a cool current of air: it was also used as a means of communication, as every movement, every opening and closing of the fan, had its significance. This language, known to every level of society, meant that women could give a secret sign of encouragement to the man of her choice, or indicate her lack of interest. A lapdog was a fashion accessory for elegant women. As a recognized symbol of fidelity, the dog was also a traditional element in portraits of women. Here, however, the normally alert protector of feminine virtue is curled up asleep on the young woman's lap while she looks out almost invitingly. Goya repeatedly used the theme of the relationship between men and women, happy or despairing, in every possible combination. In the late painting The Letter (below left), a beautiful woman steps out of the shade of the parasol into the full daylight while she looks slightly mockingly at the letter she is holding in her hand. In this picture too the little dog, here begging for attention, is a comment on the painting's theme. The happy, intimate atmosphere of The Parasol is created not least by the skillful color composition. The silky yellow of her dress. the light blue of her bodice, the bright red of her headdress and the man's waistcoat, and the rich green of the parasol form a harmonious combination of luminous tones that give a clear emphasis to the two figures. The background is a vague setting of subdued tones of blue and green that contrasts with the rich harmonies of color in the foreground. Goya applied the color generously and energetically. However, it is the effect of the light that is most remarkable, since it gives this scene an almost impressionistic quality. The areas of light and shade contrast sharply. The young man is almost completely bathed in shadow, with light from the left falling onto his face and shoulder. In contrast, the woman's elegant dress glows in full sunlight, while her face remains in the shade of the parasol. Her softly modeled features are lit gently from below by the reflected light from her clothes. The virtuosity of the interaction of light, shade, and color recalls Tiepolo's frescoes. It is only at second glance that we notice the strangely ominous wall to the left, behind which dark clouds are massing. However, the diagonal it creates soon leads our gaze directly to the face of the young woman, whose eyes are gazing at us intently. Competition with artistic precursors was always of immense significance to Goya. He himself once said, later, that he had no teachers other than the most famous paintings in Italy and Spain, from which he had learnt almost everything. At the beginning of his career he had no desire to make a stand against convention and tradition. On the contrary, he often based his work closely on earlier and contemporary models in order to improve his own skills. Later he continued to use such models but now gave them a fresh interpretation, introducing completely new relationships between quoted imagery and his own realistic observations. On July 29, 1778, an advertisement in the newspaper Gaceta de Madrid advertised nine etchings after paintings by Velazquez, "engraved by Don Francisco Goya." This series documents Goya's first intensive encounter with Velazquez' work. Encouraged by Mengs, who recommended young painters to study Velazquez, Goya had begun to study paintings by the latter in the royal collections, and to make engravings of them. Before the invention of photography, prints were the only means of reproducing paintings. During this process, a painting's nuances of color had to be converted into lines, hatching, and contours. Goya initially made precise drawings of the paintings, which he then etched on copper plates in order to make prints of them. Velazquez understood as no other painter did how to reproduce light and air with paintbrush and color. His light touch and open technique appealed to Goya, who was already tending to use freer brushstrokes. 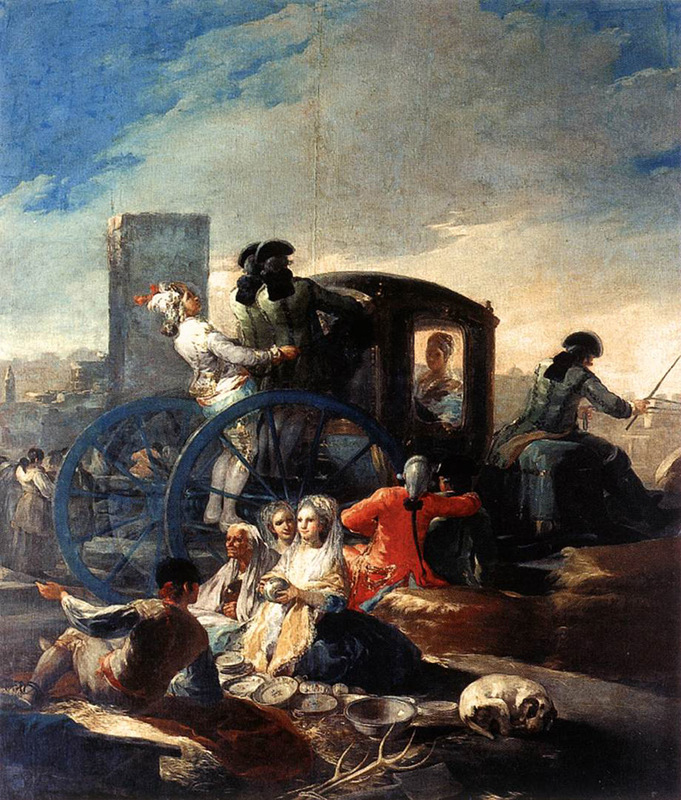 However, several decades were to pass before Goya developed a completely independent style. His development was in fact unusually slow and full of contradictions and surprising disruptions. Whenever his career demanded it, he did not hesitate to conform to the prevailing conventions. 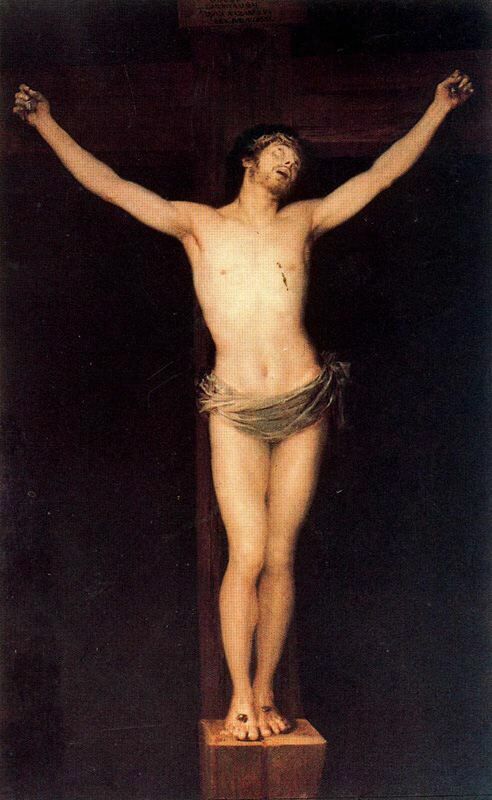 His submission for entry to the Madrid Academy of Art, the painting of Christ on the Cross, illustrates this clearly. In 1780 this smooth, academic image earned him a place in the Academy, a very important institution, and so made it possible for him to reach influential aristocratic patrons. In the same year, having just proved himself to be a good academician with this Crucifixion, Goya quarreled with his brother-in-law, Bayeu, while they were working together on a fresco commission. 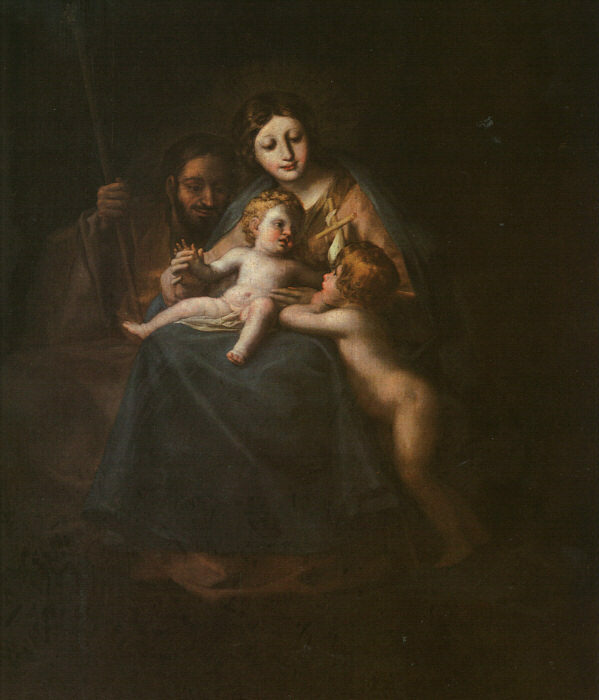 The older Bayeu probably found Goya's technique too light; the commissioners of works also rejected Goya's designs, and he had to make alterations. At this period, Goya had already moved with his family to his own house in the Calle del Desengano, in northeast Madrid; it was here that he kept his studio for over 20 years. Mengs. From Velazquez he adopted the plain dark background; from Mengs he took the posture and attitude of Christ. Goya made every effort to achieve the highly finished execution that was the academic ideal. Never again was he to paint a religious painting with such a smooth, perfect, and impersonal effect.